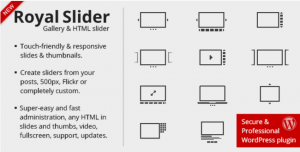 It’s a premium plugin which takes care of every functionality one might require from a slider plugin. And, this is the reason why it’s being used by tons of other premium themes. It uses HTML5 code for the slider, making it stay lightweight and modern and CSS3 is further used to get a premium makeover. Other than images, it can even allow putting YouTube or Vimeo videos. It natively supports touchscreen devices including the one powered by Retina display. Moreover, it is compatible with every modern web browser, iOS, and Android 2.3+. 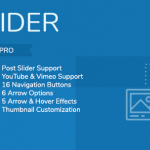 With a strict focus on performance and accessibility, Royal Slider is a feature-rich slider plugin for WordPress. 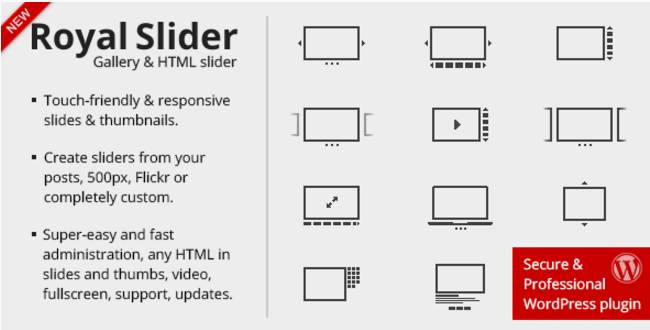 The mobile-optimized plugin allows you to create slideshows or CSS3 banner rotators by using images, videos, HTML code, images from Instagram, Flickr, 500px, videos from YouTube, Vimeo, or featured posts from your website. Thanks to the unique hardware-accelerated CSS3 transitions, you can rest assured that the slideshows will work on any internet-connected device. The smart lazy-loading technique will preload the nearby images and enhance the user experience. The plugin also features four unique skins, IE 10 support, keyboard navigation, smart autoplay, and superior admin options. It packs tons of unique layouts and offers tons of customizations to ensure images and videos are showcased in unique ways. Everything is optimized for search engines and proper mechanisms are used to keep the performance high. It uses special memory management technique which removes the images not being used in the slides. It comes with 4 editable skins and packs Physics based touch thumbnails image scroller.